White Cat Cigars machine made cigars don’t have a long history, created in 2010 for the cleverest of cigar smokers, they are still fairly new to the machine made cigar market but quickly became a favorite due to the quality of the cigar and the inexpensive price. White Cat cigars machine made cigars are open head cigarillos with a smooth seductive aroma available in multiple varieties for mass appeal. The cigars are machine made and feature a convenient foil wrapper to lock in the freshness of the tobacco. 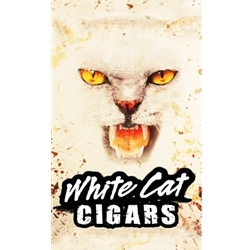 Those who know a good cigar, know White Cat Cigars! These beautifully crafted machine made cigars can satisfy a desire for a great smoke letting its user sit back and enjoy a relaxing good time. Smokers Discounts has made it easy and affordable to buy machine made cigars online. Call us for more details!